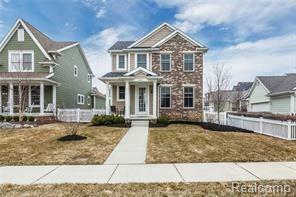 Beautiful two-story colonial in the desirable Cherry Hill Village subdivision. This home features a beautiful kitchen with a breakfast nook, hardwood flooring, upgraded cabinetry, and granite countertops. Large dining room leads to the inviting family room which offers a cozy fireplace. Large master suite with vaulted ceilings, a walk-in closet, and dual vanities in the bathroom. You will find a brand new finished lower level with a large open feel. Off the breakfast nook, a door will lead you outside to a stamped concrete patio and a privacy fence. All bathrooms include granite tops. Multiple parks, social events, food, etc located within walking distance. Come see everything this home has to offer!